Road accidents are one of the leading causes of deaths everywhere around the world. There is actually no guarantee that you will experience a totally safe and accident free driving because even if the most careful drivers still have a chance to be involved in a road accident that could cause property damage at the very least. That is why it is only necessary for you to be able to do everything that you can to minimize the number of accidents that occur in the road everyday. Obey traffic rules and regulations. Always keep in mind that laws are created not to limit the people but to protect them. That is why driving vehicles can be really fatal if they are not operated properly and laws of the road are not strictly implemented. So whenever you drive your car, always see to it that you adhere to the traffic rules at all times. If you want to avoid being caught and pay huge fines or be involve in an accident, always see to it that you follow trafic signals and laws. Focus on the road. It is also important for us to be aware of our surroundings and everything that is going on in traffic. You should pay attention to the road while you’re behind the wheel. Avoid doing anything while driving like eating, drinking or applying your make up as these are the ones which usually causes accidents. Try to start things up earlier so you won’t have to do all those things while you’re driving on the road. Do not use your cellphone while driving. This is one of the most common causes of road accidents. Surely, cellphones are considered as a great survival tool but if you don’t use them at the right place and time, it could actually be the one which will cost your life. 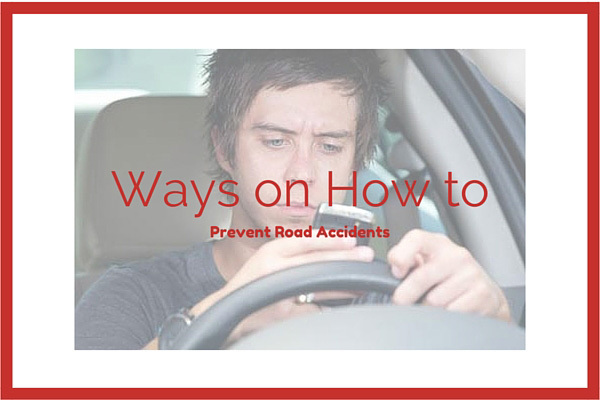 Try hard not to text message or call while you are driving. Remember that you can still be able to read your messages once you get to your destination, but if you read them while you are still driving chances are you might not be able to reach your destination at all. So do not use your phones while driving. Don’t drive under the influence of drugs or alcohol. Another major cause of road accidents are those people who choose to drive even if they are drunk. Just bear in mind that if you really have to drink, look for alternative ways in which you’d be able to get home. find a friend who can drive for you. You could also take a cab or better yet, choose to spend the night in the place where you are as much as possible. But never ever drive after you have been drinking. Road accidents can be prevented. Just always keep in mind these simple things the next time you sit behind the wheels not only for you, but for other motorists’ safety as well. Remember, drive responsibly to live longer.